You enter God’s kingdom not by dying or by drifting, but by living—by venturing on Jesus. In a word, you seek. God, of course, wants to be sought and delights in being found. That’s why He doesn’t barge through our doors. He also seeks us and celebrates when we’re found. The problem for many Christians is that they stop seeking life once they get forgiveness. Like me, they assume or have been told that atonement for sin is all there is to life from above. But forgiveness for the same sinful habits over and over isn’t the same as getting beyond their control. 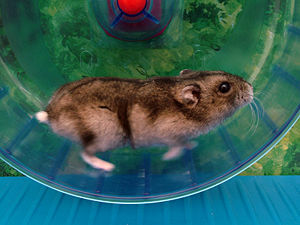 A hamster spends much of its life on the wheel, but doesn’t live beyond the cage. I think the problem stems from confusing atonement with regeneration—related, but not identical. Atonement alone didn’t make me like Christ even after 40 years as a Christian. For example, until about seven years ago, my idea of rightness and compatibility with God was to be irritated with the world. I was supposed to pray and promote well-being for my family and friends, but not my enemies, and certainly not God’s. My duty was to police my neighbors. I should insist and impose correctness, make things happen, and not take No for an answer. Otherwise, I was a slacker, not committed to the “truth” that people are incurable, even with God’s help. So why did Jesus focus primarily on non-essential fluff like love or wisdom? It made no sense. To outwit and abolish Death. To give his life as ransom for many, that they may have life to the fullest. Forgiveness is part of it, but we still have a life to live. Rightness is the by-product of wisdom and love, and my few years of practice has produced more than the previous four decades did. I’m still learning, but I’ve decided to be a slacker, on purpose. And I’m not quite as quick as I used to be—quick to anger and impatience. I’m grateful for this delightful new adventure with God in which together, we overcome evil with good. The truth doesn’t keep you stuck; it sets you free. So, seek new life the way you’d search for a lost cell phone. Study the person of Jesus, and learn to do what he says to do. This gets you off the sin-forgiveness-sin wheel and beyond the cage, where you belong.